✅ Trip Verified | Seriously unprofessional immigration officer. I was in transit and going through immigration. I am walking with crutches because I hurt my leg. There was not one person in line, seriously not one person. I don’t mean just a few people, I mean nobody! So I tried to skip the long serpentine and go directly to the counter but the officer said I had to do the serpentine. So I rolled my eyes and walked back. He got angry and told me I had to calm down. So I am limping, I had only rolled my eyes and he is telling me to calm down? I just smiled at him, walked back and did what he asked. I get to the counter and he is still rude with me, annoyed I don’t speak spanish. I keep on smiling and finally make it through. After a few steps there’s the metal detector she asks me if I had gone through immigration. I say yes but she doesn’t believe me and goes to the immigration counter to verify. Come on! Just to complete the picture, I had arrived in Buenos Aires on Aerolineas Argentinas from Rio de Janeiro. I am first row business class so I ask the hostess if she can place my crutches somewhere and she just tells me to fix them on my own in the overhead compartment. Fine, I can do it but is this the service you give me with a 5.000 euro ticket? Even if I had not paid for my ticket, don’t you just automatically help someone with crutches out of your good heart? I travel the world for business very much, about 2 intercontinental trips a month but this was my first time going through Argentina and on an Argentinian airline. I have always thought that french people were unpleasant but wow, meet the Argentinians and you will definitely change your mind. This was a big surprise as in general the South Americans I know (Brazilians, Colombians, Chileans) are so nice. ✅ Trip Verified | Not terrible, everything is long and poorly done, very unpleasant staff and no help, it is quite dirty and poorly done. In work and for a moment. Many things are broken down or defective, a lot to do. Almost no seat before checkin. | Pas terrible, tout est long et mal fait, personnel très désagréable et d'aucun secours, c'est assez sale et mal fait. En travaux et pour un moment. Beaucoup^de choses sont en pannes ou défectueuses, énormément à faire. Presque pas de siège avant le checkin. ✅ Trip Verified | Terminal C domestic departures. Luckily queuing for security was not too bad about 20 minutes, but the facilities are dire. One tiny cafe with a queue time of 30 minutes to get a coffee. As I write a line of about 30-40 people were queuing to order. Florida cafe outside departures was also dire, waitresses service but so busy never came to our table despite hailing her twice. Very disappointing. "worst baggage handling that I’ve ever seen"
✅ Trip Verified | The arrival area was modern and immigration was fairly fast and friendly, despite the complexity of photos, thumb prints, and taking down your hotel. Then you get to wait for baggage collection - 30 minutes before the first of our bags arrived, then another 20 before any others came. This gets close to the worst baggage handling that I’ve ever seen. Also, this is one of those airports where everyone crowds around the belt several rows deep like a pack of savages. If you’ve ever seen Port Moresby’s domestic terminal baggage belt, this is worse. Customs was easy, just random baggage x-rays, then through a door are the airport taxi services, which seemed fairly well organised and honest. Good thing they take credit cards because all the money services are through the next door. ATMs charge 200 peso fees with a 3,000 peso withdrawal limit but that’s the same as in downtown Buenos Aires. I couldn’t even find the cash exchange booths (maybe over near check in?) and there’s a crush of people at the exit dissuading you from looking around - people really like to get in everyone’s way at this airport. Make sure your taxi is using the toll roads and you can be downtown in 45 minutes. ❎ Not Verified | Terrible immigrations lines with half the windows open, more than one hour waiting, only to have my passport not stamped. After contacting immigration for help they referred me to the information web page, which really only gives, the email I contacted them by. Incompetence at its finest. "service was also badly organized"
✅ Verified Review | The immigration processes have improved considerably in the last few years and the lines were not long. Perhaps also the arrivals and departures to Europe are now more dispersed over the day so that there is less chaos of several jet planes arriving or departing at about the same time. My principal concern is the quality of restaurants and cafeterias. After the security control, you have obviously a very limited choice, but at Ezeiza, it is limited to about one company. At Bellini's, a "Lady Di salad", a 'Parma' ham salad with a coke cost about 17 euros - and the quality of the salad was lowest ever in Argentina. It was a huge bed of lettuce, two small and thin slices of ham, a thin slice of processed cheese and five olives. In Argentina, you used to worrying what to do when you always get more food than you can manage, but this was the total opposite. A salad that cost as much as a good meal in a quality restaurant - and you are left with hunger. The service was also badly organized - a combination of self service and table service, which combines the poorest sides of both: having to go to the counter, slowness, dependence on the waiter who is just chatting with other waiters. Future passengers are advised to bring their own food or otherwise check in as late as possible. These would cause problems in the customs, or delays in passenger arrival. I say this to show that it is really important for the whole airport function that people can arrive in good time and rely on getting something decent to eat while waiting. My rating is mostly defined by this restaurant. "the terminal in general is quite new"
Ezeiza es el aeropuerto de Buenos Aires que es utilizado para los vuelos internacionales. La terminal que yo utilize fue la C que es la de Aerolíneas Argentinas. Al llegar al aeropuerto (como es habitual) la terminal de Aerolíneas Argentinas es un caos y al mismo tiempo un desastre. 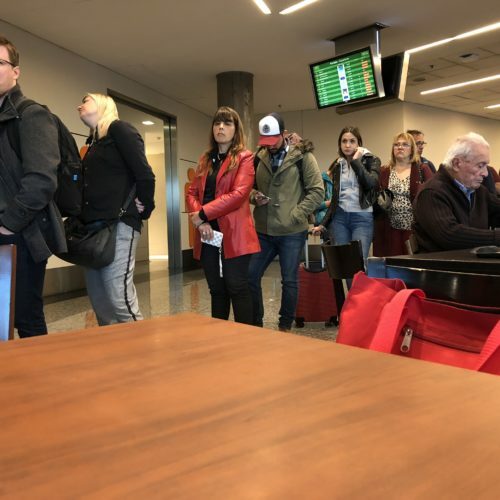 Para hacer el check in uno esta aproximadamente una hora haciendo la fila porque a la noche Aerolíneas Argentinas tiene entre 6 y 9 vuelos que salen casi al mismo horario. El personal de la linea aérea siempre es amable y solucionan todos los inconvenientes. La terminal en general es bastante nueva. Lo peor de Ezeiza es el personal de seguridad, pero no la PSA, me refiero a una compañía terciarizada de seguridad que tratan a los pasajeros como basura. Estos empleados se encuentran en la zona del check in y en la puerta de la manga del avión. Cuando uno llega a la manga del avión ellos toman las pertenencias del pasajero y les revisan todo para sacar artículos que en el control de seguridad general no sacaron. El duty free de Ezeiza es uno de los mas caros que he visto, pero de todas formas tienen lindas cosas. La zona de pre embarque cuenta con varias sillas que algunas son mas grandes y cuentan con apoya pies, pero son pocas y siempre están ocupadas. Para llegar al aeropuerto es un verdadero problema porque es muy lejos de la ciudad y no hay transportes que lleven a los pasajeros. Solo hay una empresa privada de micros y la alternativa es Uber o un Taxi que cuestan muy caros. El wifi (por lo menos en mi experiencia) fue pésimo. Ezeiza is the Buenos Aires airport that is used for international flights. The terminal that I use was the C that is that of Aerolíneas Argentinas. Arriving at the airport (as usual) the Aerolíneas Argentinas terminal is a chaos and at the same time a disaster. To check in one is about an hour in line because at night Aerolíneas Argentinas has between 6 and 9 flights that leave almost at the same time. The airline staff is always friendly and solves all the inconveniences. The terminal in general is quite new. The worst thing about Ezeiza is the security staff, but not the PSA, I mean a third-party security company. These employees are located in the check-in area and at the door of the airplane's sleeve. When one arrives in the sleeve of the airplane they take the belongings of the passenger and they inspect everything to take articles that in the control of general security did not take out. The duty free of Ezeiza is one of the most expensive I've seen, but they have nice things anyway. The pre-boarding area has several chairs that some are larger and have foot supports, but they are few and always occupied. To get to the airport is a real problem because it is very far from the city and there are no transports that take passengers. There is only one private company of micros and the alternative is Uber or a Taxi that cost very expensive. The wifi (at least in my experience) was lousy. ✅ Verified Review | Aeropaque es el aeropuerto de vuelos domésticos y regionales de Buenos Aires. Es un aeropuerto relativamente chico, no tiene el tamaño de otros aeropuertos. La zona del check in de Aerolineas esta siempre llena de gente. Tiene pocas cintas de seguridad en el sector de vuelos domésticos (no recuerdo si 3 o 4 scanners pero si recuerdo que siempre hay 2 funcionando nada mas). Esta zona no cuenta con fila prioritaria para pasajeros de primera clase o miembros de algún programa de millas. La limpieza es excelente. La tienda de regalos es grande pero no cuenta con muchas cosas interesantes. Los precios son mucho mas altos y todo lo que venden se puede conseguir en cualquier centro comercial de Buenos Aires. La zona de embarque es grande, cuenta con muchas sillas. El aeropuerto no tiene muchas mangas por lo que casi todas las veces que viajo el avión se encuentra en posición remota y hay que tomar un bus bastante incomodo. El wifi es muy lento. Aeropaque is the domestic and regional airport of Buenos Aires. It is a relatively small airport, not the size of other airports. The check in area of ​​Aerolineas is always crowded. It has few security tapes in the domestic flights sector (I do not remember if 3 or 4 scanners but if I remember that there are always 2 working nothing more). This area does not have priority queue for first class passengers or members of any mileage program. Cleanliness is excellent. The gift shop is large but does not have many interesting things. The prices are much higher and everything they sell can be obtained in any commercial center of Buenos Aires. The boarding area is large with many chairs. The airport does not have many sleeves so almost every time I travel the plane is in a remote position and you have to take a rather uncomfortable bus. The wifi is very slow. "nice airport, easy to navigate"
Aerolineas Argentinas' departure terminal is primitive and chaotic. 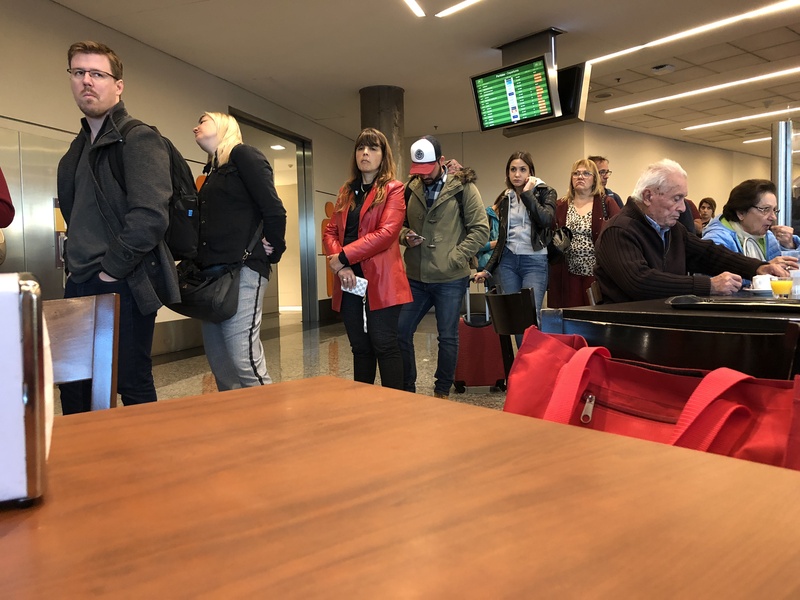 Instead of everyone standing in one check-in line and being served by the next available agent, you stand in line by flight. The lines snake through the building and there is no one to tell you what you are supposed to do. The check-in area was dirty and overcrowded. Our gate was at a beautiful, new part of the airport with a few services. But, getting there from check-in is stressful and very unpleasant. The road to the airport was strewn with burned cars from rioting over power failures during the heat wave. I don't recommend this airport, but if you are flying international, it is your only option.